Oozells Square is almost entirely hidden between Broad Street and Brindley Place, and tends to escape the worst of the drunken antics from the Broad Street drink-till-you-drop establishments. It’s home to a number of venues including Thai Edge, Ikon Gallery and cafe, Cielho restaurant and Piccolino Italian restauarant. 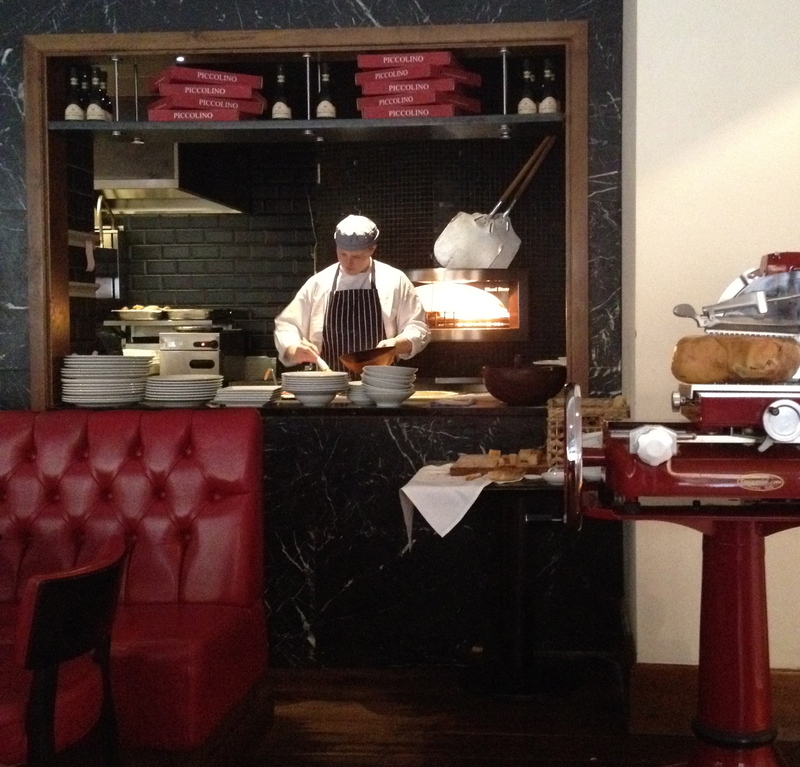 We visited Piccolino with a group of friends a couple of weeks ago for a catch-up Sunday lunch. In the summer it’s a great spot to sit outside drinking wine, cocktails, or Peroni while the world passes by. The outdoor space isn’t wasted in Spring or Autumn though as the patio heaters provide ample heat on the sunnier days to enjoy the crisp atmosphere over a beer or mojito. The cocktails are dependable here, which isn’t always to be assured at all bars in the city. Piccolino isn’t somewhere to come if you’re in a rush – the service can be slow. Sometimes though it’s nice to just amble through an afternoon with food and good wine in good company, definitely a place to come for that. The reds, whites, and woods of the interior give the place a plush feel, with red leather booths for diners to huddle together in. It also boasts an open kitchen so you can watch the chef and his team prepare dinner. The menu is an Italian feast. Starters, at around £8 include Calamari Fritti, Bruschetta Con Funghi (mushroom bruschetta), Asparagi (asparagus with egg), Cozze alla crema (mussels with a cream sauce), and our favourite, Carpaccio of beef. 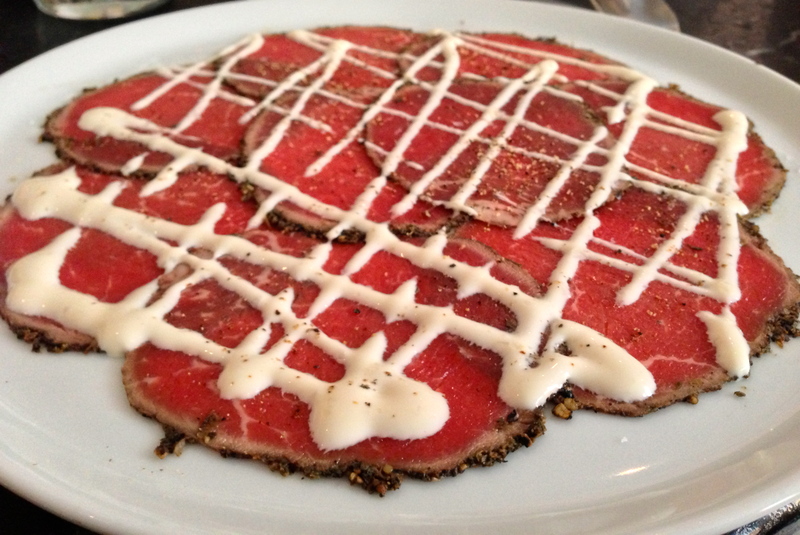 The peppered raw beef is served with a dressing and topped with a salad of Rocket and parmesan. It was delicious. I’m told by my vegetarian friend (yes, I have a vegetarian friend, who would have thought?!) that the asparagus was also very good. The egg did look perfectly poached for asparagus spear dipping. The mains are split between pastas and risottos (around £10), fish and meat dishes (around £18) and steaks (around £22). I had the Merluzzo Piccante – a dish of roast cod and Calabrian spicy sausage with chilli and garlic butter, it was tasty and not overly spicy – the flavours of the sausage and cod weren’t washed away by the heat. The squash and hazelnut ravioli with amaretti biscuits was distinctly different and enjoyable. Of the 8 mains we had, all were good apart from the Agnello Cacciatora (slow roast lamb shank) which was unfortunately a bit tough and dry. 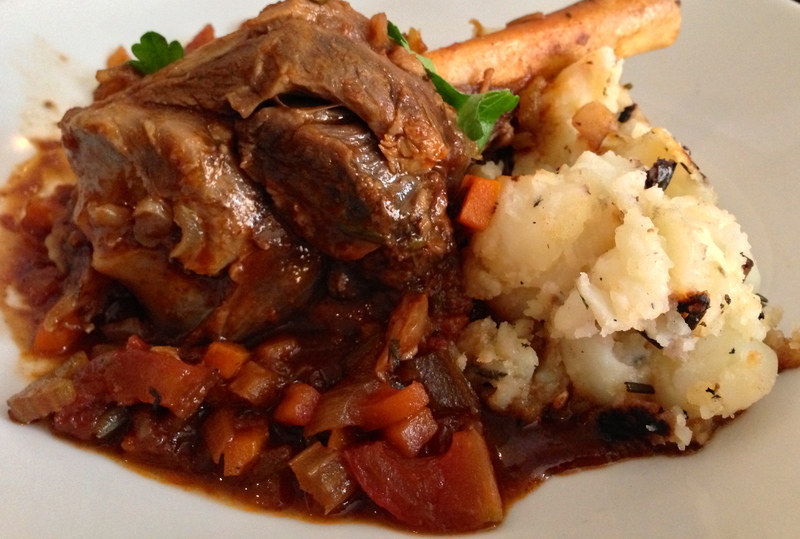 They also offer a Sunday lunch menu – we’ve sampled this in the past and it’s been delicious. It’s served “family style” i.e. you serve yourselves from platters in the centre of the table. It wasn’t a really boozy lunch but I did have a nice glass of Montepulciano d’Abruzzo – the wines by the glass are reasonably priced although entirely Italian – as well it should be in an Italian restaurant! For desserts (around £6) I had the Affogato (amaretto and espresso over a dollop of vanilla ice cream). I don’t have a sweet tooth so the bitterness of the espresso works for me. We also had the Tiramisu, and lovely made-in-restaurant ice cream. The service wasn’t perfect, and there was a bit of an hilarious language barrier with a couple of the very Italian staff, but they were very pleasant. Well worth a visit in my opinion. This entry was posted in Area: Brindley Place, Cuisine: Italian, Price: Average, Venue type: Bar, Venue type: Cocktail Bar, Venue type: Restaurant. Bookmark the permalink.